Mutt email application is a text-based email client for Unix-like systems. This application is fast and highly configurable email application. It is text based and hence, it is considered ideal for emailing and checking emails over Secure Shell. It comes with most of the versions of Linux and UNIX and some of the Windows machines as well. With an extended supports towards several protocols it covers the major one like; IMAP, MIME, POP, and PGP/GPG. Some Mutt programs can be configured with special features and facilities when facilitated with additional installation done by Mutt developers or third parties. Mutt application is a command-line application and required external Mutt email reader tool to view Mutt mailbox. If user is aware of the shortcuts to be used, users can use this Mutt email client than any other graphical applications. Text editors are used for composing the emails. Mutt application support many file formats for storing different types of data types like emails, addressbook, etc. For emails, both MBOX and Maildir file formats are used as per the settings done by user while configuration. It also supports MIME. Mutt is designed by MUA (Mail User Agent) had several features like composing and filtering messages. To open Mutt MBOX file, user need to know that Mutt application shows emails in the spoolfile (~/.mail/inbox) when it starts. Once the emails are read, they are moved to $mbox (~/.mail/read_inbox. This moving of emails to MBOX file will be done when the variable is set as ‘move=yes’. If the file type chosen is MBOX and the email data is set to be stored on MBOX file format, investigators can open Mutt MBOX file and start performing the investigation on emails by using Mutt email reader. This file format comprises of emails in linear sequence of the messages with some identification codes to separate the emails following RFC 5322 format. Emails appear in a concatenated format involving emails belonging to allied folder. Separate file is created for separate folder following the hierarchy as per the settings. How To View Mutt Application Emails? Mutt application stores emails in MBOX files if the settings is done so. You can view MBOX file using an external MBOX file viewer. This application supports all sorts of the MBOX files including the Mutt application file. It provides an enhanced platform to open Mutt MBOX file and its attributes. Users can install this application in Windows system and easily view Mutt mailbox. Databases of Linux and UNIX systems can also be moved to Windows workstation for scrutiny. Download and Install the application and launch the software program in this system. Now in order to view Mutt MBOX files, click on Add File which will open another pop-up window. Click on Browse to navigate to the MBOX files saved in the system. Then click on Add File. This will add the file to Mutt email reader tool once the indexing of file is done successfully. 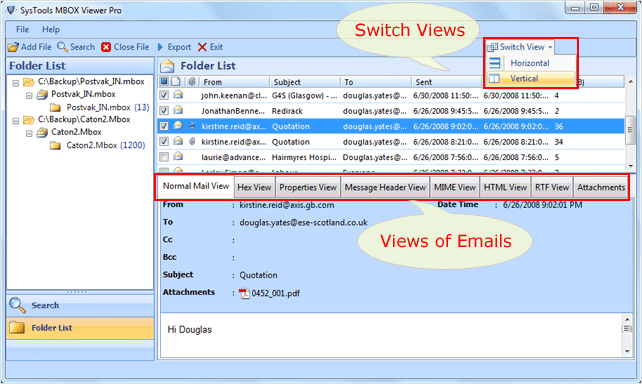 Complete hierarchy of the emails can be viewed in the right pane where emails are listed displaying their attributes. Tool also provides option to open Mutt MBOX file in multiple views like Normal, Hex, MIME, Message Header, HTML, RTF, etc. for detailed preview of emails. Mutt application can save email files in several email formats as per the configuration settings done. Forensicators face several challenges while performing investigation on Mutt mail application. However, advance applications like Mutt Email Reader can aid and simplify the viewing of mutt mailbox.